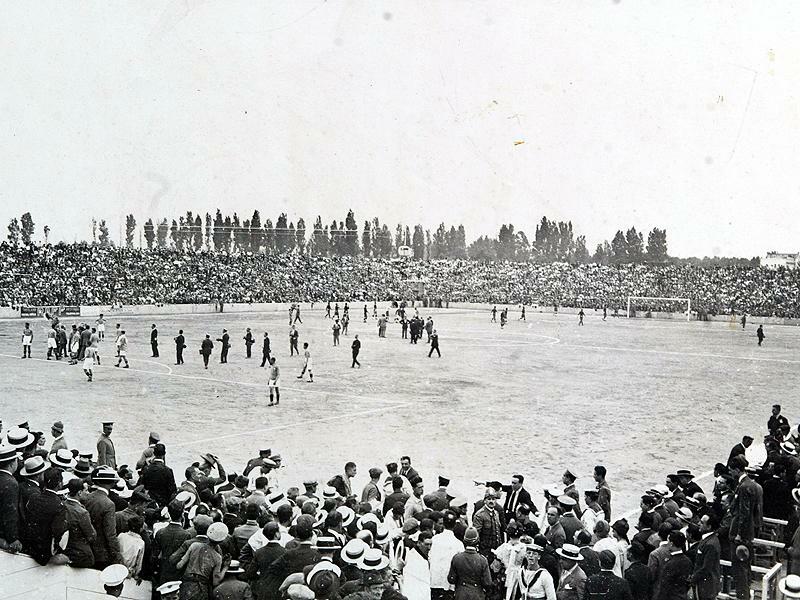 Estadio de Mestalla opened on the 20th of May 1923 with a friendly between Valencia and Levante. It could initially hold 17,000 fans, but was quickly expanded to a capacity of 25,000. 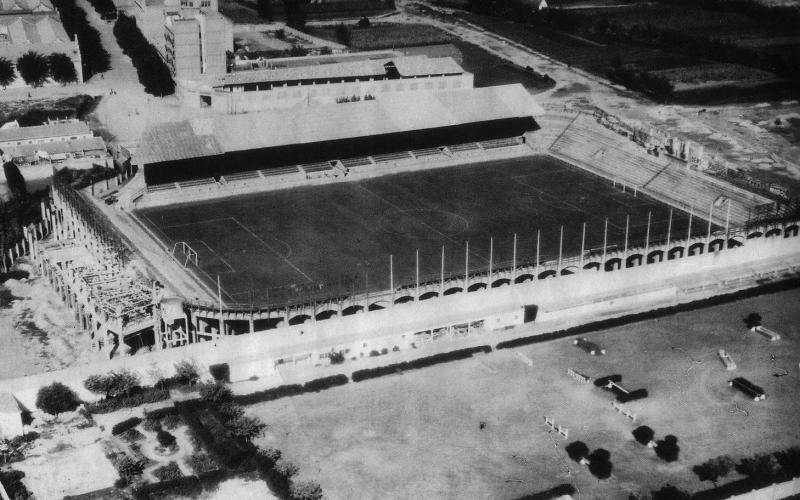 During the Spanish civil war, the stadium served as a concentration camp and junk yard, and as a result got heavily damaged to the point that not much remained of it after the war. 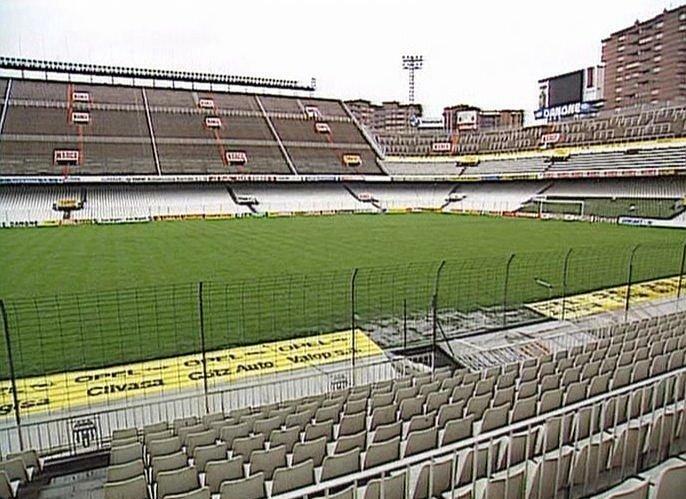 Mestalla got restored after the war, but remained a modest affair until the club embarked on a grand redevelopment program called “Gran Mestalla”, which involved the construction of a new main stand and the expansion of all other stands. Works were finished in 1955 and raised capacity to 45,000 places. In 1957, part of the new stadium collapsed after the river Tùria flooded the city, but the stadium was soon rebuilt. In 1962, Nottingham Forest was the first foreign team to play at Mestalla. In 1969, the stadium was renamed after former president Luis Casanova, an honour that overwhelmed him so much that he asked in 1994 to change the name back to Mestalla. 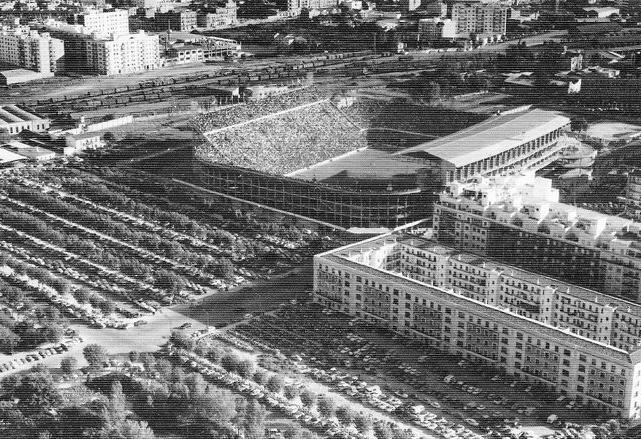 In the 1970s, Valencia considered moving to a new stadium on the edge of the city, but instead decided to redevelop Mestalla, which was made necessary by the upcoming 1982 World Cup. Works included the reconstruction of the bottom tier, which until then still consisted of a brick structure and was replaced by a concrete one. 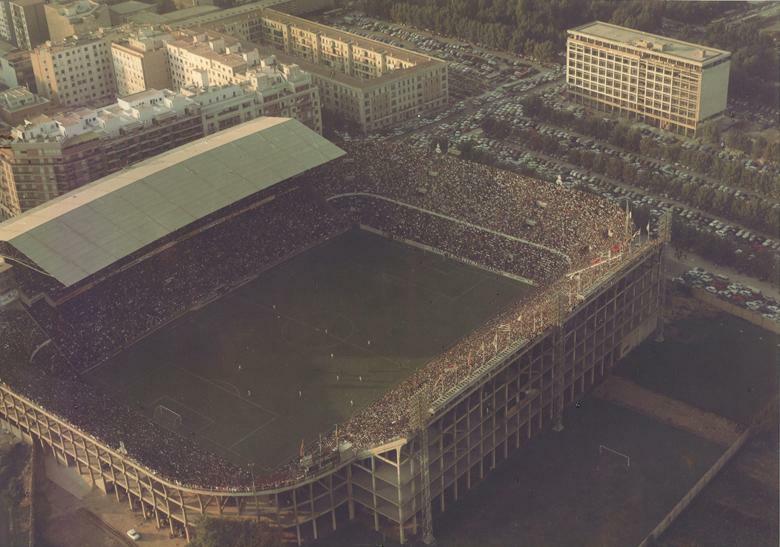 During the 1982 World Cup, Mestalla hosted all of Spain’s three first round group matches. The stadium remained more or less the same for the next fifteen years. It underwent its last redevelopment between 1997 and 2001 when both ends and one side got expanded with an extra tier, and new access towers were built in the corners. Estadio de Mestalla still lacked many modern facilities though, and Valencia soon after announced plans for a new stadium in the north of the city. Construction of the 75,000-seater started in 2007, but works were halted in early 2009 due to a lack of funding and presently do not seem likely to recommence any time soon. Estadio de Mestalla is located just east of Valencia’s historic city centre. The walk from the cathedral or the main railway station (Estación del Norte) takes no more than 30 minutes. Alternatively, the stadium can be reached by metro. Metro stop Aragón, on line 5, lies next to the stadium. Line 5 will also bring you to the airport. Another option is taking metro line 3 to station Facultats, which lies a 5-minute walk north of the stadium. Estadio de Mestalla is located in a dense urban neighbourhood close to Valencia’s city centre. There are plenty of cafés and restaurants in the area of the stadium, while more serious nightlife can be found a small walk away in the historic centre. There is, for example, a pocket of nightlife around Plaza de Canovas at less than 10 minutes walking from the stadium, but there is much more further on in the historic centre, while there is a club scene around the city’s beaches. There is a wide variety of hotels in Valencia, and some very good options close to Mestalla. Hospes Palau de la Mar, Hotel Husa Dimar, and SH Valencia Palace are on the edge of the historic centre and less than 10 minutes walking from the stadium. Hotel Renasa, NH Villacarlos, and Hotel Kris Consul del Mar are equally close, somewhat cheaper, but a little further away from the centre. Click here for all hotels near Estadio de Mestalla. There are many more options in the historic centre at just 5 to 10 minutes more walking. Alternatively, you can choose a hotel closer to the beachfront. Tickets for Valencia games can be purchased online through the official website, Ticketmaster, or Entradas.com. Tickets can also be bought in person at the Mestalla ticket windows, at the Valencia megastore on the Avinguda del Marqués de Sotelo right off Plaça de l’Ajuntament square in the city centre, or at one of the Fenamix sales points. 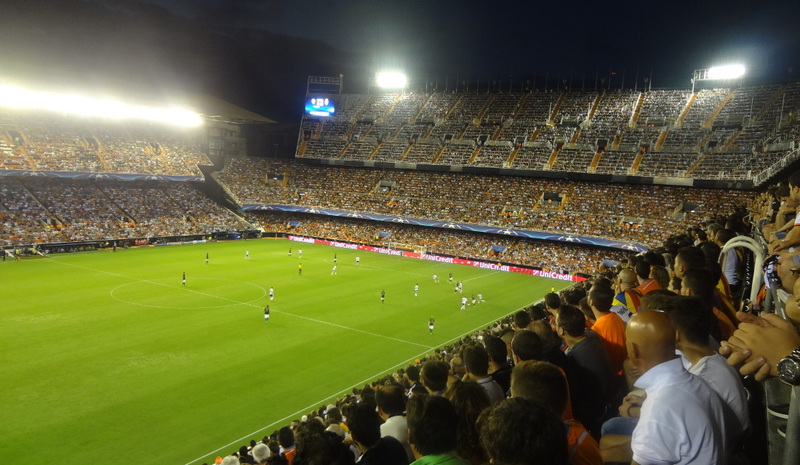 Valencia’s attendances are among the highest in the league, but they sell out only a few high-profile matches per season. In these cases you may have to settle for resellers such as viagogo and ticketbis. These websites may also be your only option if Ticketmaster and Entradas.com don’t accept your foreign credit card. Ticket prices depend on the opponent, but can start as cheap as €10.00 for the upper tiers ranging up to €65.00 for the best seats at the main stand. Most tickets go for between €15.00 and €35.00. Tickets for the Barcelona and Madrid matches will be significantly more expensive. Valencia offer guided stadium tours around Mestalla, that include access to the dressing rooms, players’ tunnel, and press room. The tours last about an hour. Tours run continuously Mondays to Fridays between 10:30 am and 2:30 pm and 3:30 pm and 5:30 pm, and Sundays between 10:30 am and 1:30 pm. On matchdays tours only run until 5 hours before kick-off and don’t include the dressing rooms. The tour costs €10.20. Bookings can be made online through a form, by phone +34963 372 626, or at the tour ticket window at Mestalla, but are not required. Email tourmestalla@dtaocioyturismo.com for more information. Valenciacf.com – Official website of Valencia CF. Went to watch Valencia against Granada few weeks ago. The game itself was not the best( 1-0 to Valencia). Tickets were very cheap. I got mine from the ticket window on the day of the game for 15 Euros, but the cheapest were for 8!! I was seating high up, but the view was amazing. There was a section of home fans behind one of the goals that was singing for the entire game. What surprised me was the fact that straight after the half-time whistle everyone got out sandwiches. It looked really strange. Valencia is a very beautiful city and would like to recommend a visit to everybody. It was a great day! Went to a game in the Mestalla against Athletico Bilbao on November 9th. Though not a great match (it ended 0-0) the atmosphere was amazing. My friend got the tickets through ticket master and they cost 30 euros. Well worth it the atmospere alone was worth the entrance fee. Was sitting next to a few Athletico fans in a predominantly Valencia section but felt no bad vibes. Needless to say i was wearing an orange hoodie and blue trainers so i was covered.